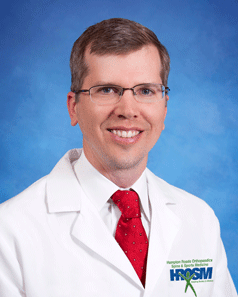 Newport News, VA (Friday, March 22, 2019) – On Wednesday, March 20th, Dr. John Aldridge, board certified orthopaedic surgeon with Hampton Roads Orthopaedics Spine & Sports Medicine, performed the first outpatient total hip replacement at Mary Immaculate Ambulatory Surgery Center. Outpatient surgery, also called “same day” or ambulatory surgery, occurs when the patient is expected to go home the same day as the surgery. The direct anterior approach to total hip replacement can require a 1-3 night stay in the hospital, but if the patient is in overall good health and have the right support system at home then it isn’t always necessary. The orthopaedic surgical community is moving towards outpatient surgery for total joint replacements for a multitude of reasons. The world of orthopaedics has advanced to a place where we can effectively and safely provide total hip replacement for patients. The benefits of outpatient surgery include reducing the risk of infection, improving patient satisfaction, and the opportunity to begin their recovery at home on the same day. “The surgery was a great success, with no complications and the procedure was finished in 40 minutes. Then instead of having Mr. Hutchinson stay over-night at the hospital, we were able to send him home to sleep in his own bed,” stated Dr. Aldridge. Now, Mr. Hutchinson is home and he is able mobile with little pain. Dr. Aldridge is excited to continue moving towards performing more outpatient total hip replacements for eligible patients in the future.